When the weather gets very cold, the Over The Knee Boots come out. I have to be honest and say that even though I own three pairs of OTK boots, I still don't feel comfortable wearing them. But, they are so, so warm! They are perfect for frigid weather, you know when it's so cold out your legs freeze through your jeans. But not if I have OTK boots on, I don't feel the cold at all. So I put on my brave face, and wear my OTK whenever the temps drop to the single digits, because these babies keep my legs warm. When I appeared before my husband for our photo shoot wearing this outfit he said "That's what you're wearing? It's all old stuff". 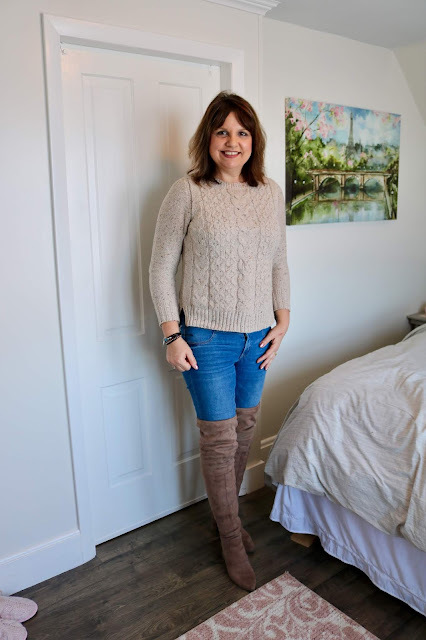 I replied, "Well, I like to show new items but I also feel my fashion posts are about what I really wear, and this is what I really wore this week!". So yes, everything in this outfit is a year old or more. 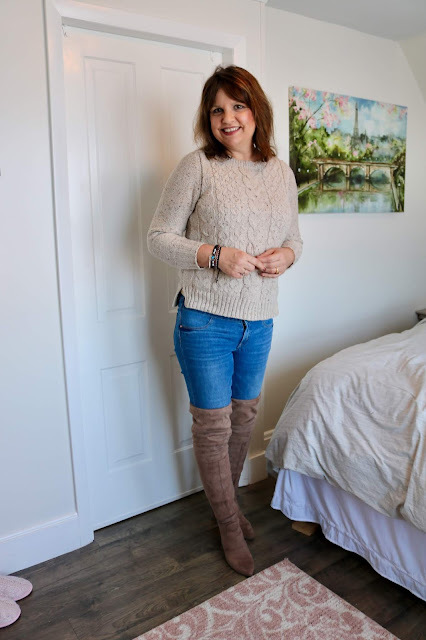 The classic cable knit sweater is my go-to sweater for really cold weather and it is super warm! I purchased these boots from Agaci last year and they have really held up well. I didn't want to spend a lot of money on OTK boots because I wasn't sure how much use I would get out of them. 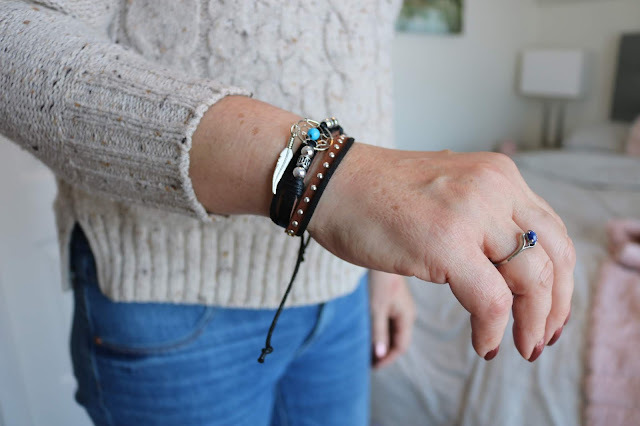 For jewelry, I kept it simple and wore western style bracelets I picked up on my vacation to South Dakota. I do recommend purchasing OTK boots that tie in the back, as my first pair did not and I always have a problem with them slipping down. So what about you? 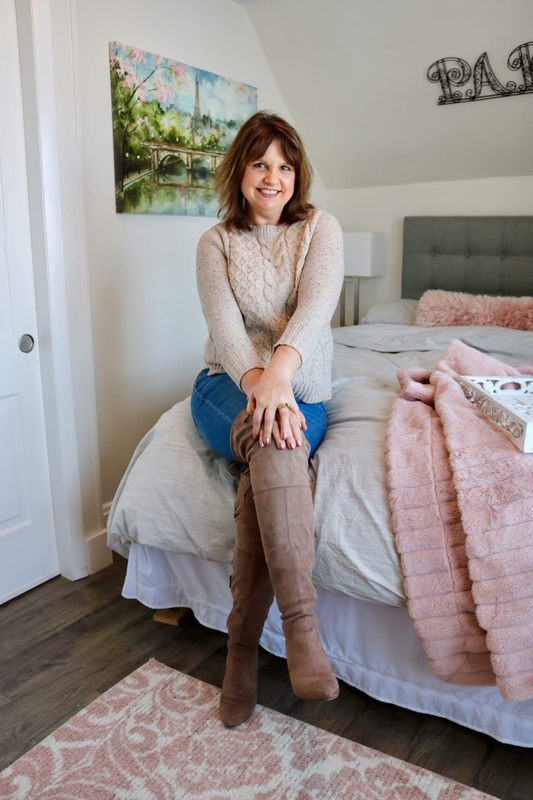 Do you have any go-to pieces that you like to wear when the weather gets frigid? I'd love to hear from you. Oh those boots are divine! I don't own any OTKs as I think my thick calves would be a shopping challenge but oh how cosy yet stylish you look. And I loved that conversation with your hubby, sounds familiar! Keep warm in your OTKs and cosy jumper. Thank you. Mary I actually see more boots for wide calves when I'm shopping than regular sizes, so you might be able to find something now. Yes, I think any fashion blogger whose hubby is their photographer can relate to the conversations we have! ha ha! It's been really cold here and anything to keep warm is great!! Absolutely! And from what I hear, next week will be even worse! Hey, I also wanted to let you know I tried to comment on your blog and a message always comes saying "Comment is a spam". I'm signed into my google account and it still says that. My husband can't even remember some of my old stuff because I have so much...haha!! But I adore OTK boots, and just bought a new pair for my birthday. They ARE so much warmer and I love them with dresses especially. And for some strange reason they make me feel younger. Silly, I know, but it's true!! Ha-ha! Sometimes my husband thinks I am wearing something new when I've actually had it for years. That's great that OTK boots make you feel younger. I've actually been tempted to buy a pair of flat OTK boots for those really frigid snowy days, but then I think, no, three is enough. They look great on you and love that color with the blue jeans! I'm too short for these types of boots, so I don't own any, but I can imagine how warm they must keep your legs. Thanks Ellie. OTK come in all different shaft sizes so you might find a pair that works for you. I have very long legs and the first pair of OTK boots I bought didn't work at all because the shaft barely covered the knee. I haven't been home enough to wear my OTK boot. Bought them last year then promptly broke my foot and didn't get to wear them a time. Have only worn them twice this season. Couldn't imagine wearing them on my trips to KY to visit my mom at her senior living complex. Maybe I can wear them for Valentine's Day...they are the prettiest wine color suede. I like seeing what you really wore 'today'. Sometimes those outfits are the best inspiration because we have similar pieces in our own closets. Oh, the wine suede sounds so pretty! I hope you get to wear them on Valentine's Day. I'm glad you enjoy seeing my "what I really wore today" posts. I feel they are not always "blog worthy" but at the same time, a lot of women prefer more realistic outfits too. Thanks Mica! They are definitely boots for cold climates! Aren't hubby's the funniest?! I don't own OTK boots but I do foresee it in my future! I love the color of this one you are wearing. This entire outfit is simple yet stylish. I like that you showed off what you really wore instead of something new. 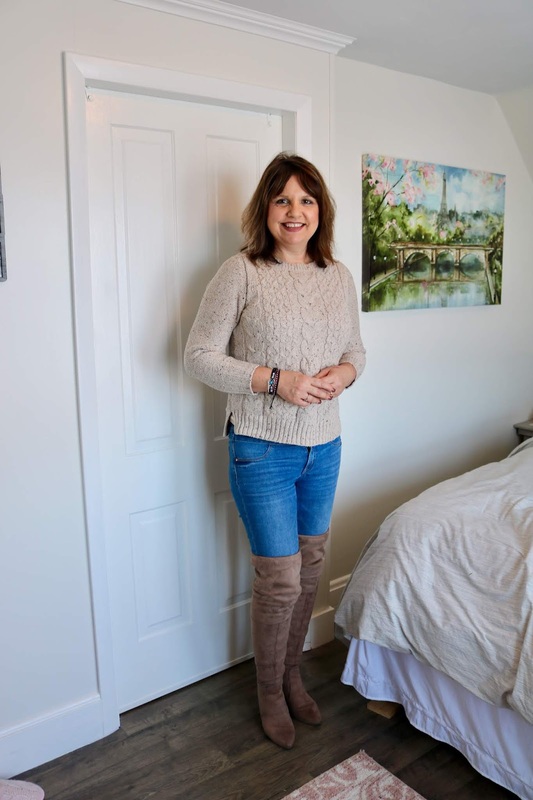 I hope you are having a great weekend so far Amy and you look great wearing these boots. Yes, hubbies are hysterical. Especially mine! He makes me laugh all the time. It's hard to do serious poses with him as my photographer. I'll say "Stop making me laugh, I need a serious expression!" And then he'll tell a joke and make me laugh. That's why most of my pictures are smiley ones. I'm glad you like my everyday "old" outfit. That's encouraging to me that I don't always have to wear something new. Can't go wrong with this combo. Also, the jeans look so good on you dear. Thank you! The sweater definitely is a classic. I'm sure I'll have it forever. i think you look amazing!! Love the otk boots! Thanks Nicole! The boots make such a statement on their own I like to keep the rest of the outfit under stated.